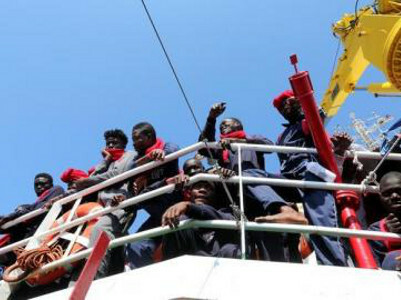 Migrants aboard a rescue ship. Italian Prime Minister Giuseppe Conte will allow 47 migrants stranded at sea off Sicily for 11 days on a rescue ship to come ashore, ending another migrant standoff. “In a few hours, they will begin to disembark,” Conte told reporters in Milan. The migrants have been aboard since they were rescued off Libya. Italy’s populist government closed its ports to humanitarian vessels in a bid to force European Union partners to take a share of migrants rescued in the Mediterranean. The Dutch-flagged Sea-Watch 3, run by a German humanitarian group, has been moored off the coast of Sicily waiting for a safe port. Some 13 minors are among those on board and the long wait has taken its toll, Sea Watch said. “Some people stopped eating, shrunk into themselves others are emotionally unstable,” Frank Dorner, the ship’s doctor, said in a statement. Five European countries agreed to accept some migrants, Conte said, naming Germany, France, Portugal, Malta and Romania. On Wednesday, he said Luxembourg and Italy would welcome some. Leaders of parties in the coalition government pressed the Netherlands, France and Germany to accept the migrants. The Netherlands refused, saying the EU must draft a plan that automatically redistributes migrants saved at sea. It is the second time in a month Sea-Watch 3 has been stranded at sea carrying rescued migrants and no safe port. The previous standoff ended after 19 days with migrants allowed ashore in Malta and an agreement among eight EU countries, including Italy, to take them in.